SSQ-6 is the perfect solution for jobs like this–parts are balancing, and if a rod were used they could easily be knocked over. 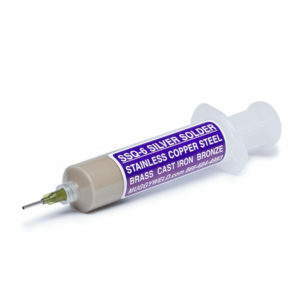 SSQ-6 silver solder paste almost glues them together and acts like a jig when heated. Watch the metal turn to a dull red then apply the paste for a perfect joint every time. Works great on “just cleaned” stainless, brass, copper, steel, bronze and even cast iron. Notice how much is applied to the rings, a little is good for this joint more will waste product.